(Branta canadensis) The hatchlings leave the nest to follow mom into the water when they are 1-2 days old! When Canadian Geese migrate, they form an impressive and aerodynamic “V” formation and they can cover over 1500 miles in 24 hours. What does the Canada goose eat? Canada Geese are herbivores and eat mostly grasses, grains, berries and skunk cabbage and can easily clean dry corn off a cob. They live about 25 years in the wild. How many Canada Geese can be born at a time? Two to eight eggs are laid each year. The hatchlings leave the nest to follow mom into the water when they are 1-2 days old. When it is time to migrate, the parents will teach the offspring the path the flock usually follows. 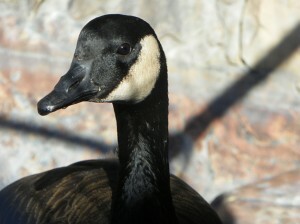 Canada Geese are found in every contiguous U.S. state and Canadian province. They are also found in Mexico. 50 geese can produce two and a half tons of excrement a year. When they migrate, they form an impressive and aerodynamic “V” formation. They can cover over 1500 miles in 24 hours. These social birds remain in flocks year round except when nesting. A mother goose loves manicured lawns as it allows for unobstructed views of her young. Deja – came to us in 2011 as an adult. She was blown into a yard in Phelan during a storm and has an injured foot. She was very friendly and so it was thought she was imprinted and someone had her as a pet.